Spring is just around the corner, which means it’s time to start thinking about your gardens. 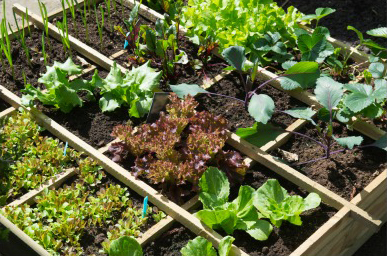 We recommend companion planting and crop rotation for best results. The following list of fruits, vegetables and herbs can be grown in March during the cooler months or started indoors. Beets – If your soil hasn’t consistently reached 50 degrees in March you’ll want to wait. You can start you beets indoors and then transplant later. Carrots – Carrots should be planted directly into the garden. It is best to plant them about 4 weeks before the last frost. Onions – You can plant onion seeds, sets or beginning plants. Spinach – Planting spinach in early March should give you plenty of time to harvest before the summer heat causes it to bolt. Plant 4 – 6 weeks before last frost. Lettuce – Make sure your spring lettuce gets plenty of light but not all day; it won’t bolt as quickly if it has some shade too. Broccoli – Plant a quick growing variety to ensure you have time to get a good head before summer. The hybrid (non gmo) Flash variety is said to be good for late crops. Cabbage – Start your cabbage indoor about 7 weeks before your last frost. Corn – Start directly in garden, not indoors; in soil at least 60 degrees. Cucumbers – Make sure you choose a variety that fits your space (bush or vining). Best to plant in the garden after the last frost has definitely happened. Peas – Sow after your last frost. Peas won’t do well once it gets really hot so if you have a hotter climate you may want to wait on peas and grow them in the fall. Peppers – Peppers love the heat but you can start them in March, indoors, and transplant them later. Summer Squash – Another vegetable you can start indoors in March for transplanting later. Squash loves the sun and good drainage. Tomatoes – If you live in a colder climate you’ll want to start your tomatoes indoors and plant them outside when the frost has passed. Melons – Most melons like long, hot summers, but you can start them inside in March to get a head start on your summer garden. Many herbs love the warmer months, also try growing them indoors.